• New Building: Grab a pint at O’Flanagan’s Pub. • New Characters: Help Tom O’Flanagan and the Leprechaun as they settle into town and fill it with Irish cheer. • New Decorations: Add a wee bit of the luck of the Irish to your town with a Wishing Well and a Shamrock Topiary. • New Quests: Will O’Flanagan’s find a place in Springfield or will the taps run dry? If you haven’t yet downloaded Tapped Out and you’re a Simpsons fan, then you’re missing out. It’s a wonderful building game that lets you create your own Springfield from scratch after Homer wiped out the old one with a nuclear meltdown. It’s almost like SimCity, but with The Simpsons. The game features original content from the show’s writers and animators, plus all your favorite characters voiced by the show’s actors. The game is completely free to play, though there are in-app purchases that’ll let you pick up donuts instantly as opposed to working for them. 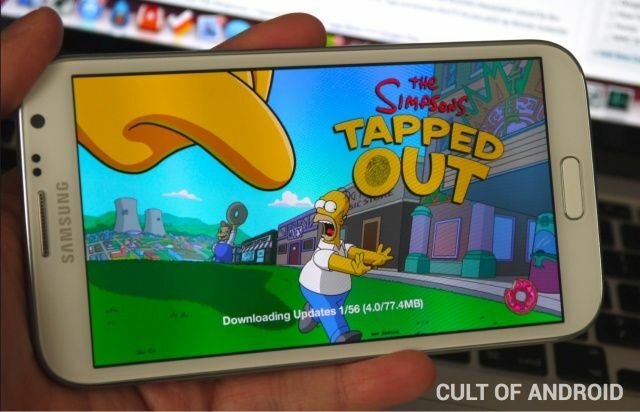 You can download The Simpsons: Tapped Out from the App Store and Google Play.